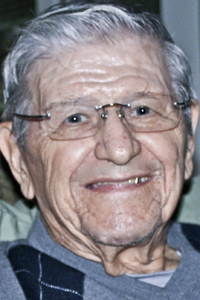 WARREN - Thomas Corsatea, 88, beloved husband of 61 years to Mary Corsatea, died Thursday, Nov. 29, 2012. He was born March 12, 1924, in Warren, the son of the late Thomas and Magdelena Macean Corsatea.He graduated from Warren G. Harding High School in 1942 and was drafted six months later, serving bravely as part GO 33 & 40 WD45 in Normandy, France, landing at Utah Beach D-Day June 6, 1944. He graduated with a business degree from Youngstown College in 1950, where he lettered as a member of the Penguin tennis team. He served as a sales consultant for American Welding & Manufacturing Co., retiring in 1980. He was a member of Elks Lodge 395 and of the Old Erie Lodge No. 3 F & AM. He enjoyed playing golf and photography and was well-known for his ability to fix anything. Retiring early, he immersed himself in Apple computers and was a founding member of the area's Mac Users Group. He is survived by his wife and two daughters, Jacqueline (Rick) Metz of Bowling Green and Tami (Dr. Jamie) Candella of Warren. He never lacked for the love and attention of his five granddaughters, Dacia Ludwick (Luke) Snider of Cincinnati, Galen Ludwick (Tyler) Harris of Columbus, Kali Candella of Warren, Kaitlin Candella of Richmond, Va., and Anna Jordan Candella of Columbus. His four great-grandchildren, Ian and Elliana Snider and Amelia and Oliver Harris, provided him with many hours of laughter and noise, but always enjoyment. He was preceded in death by sisters Betty Corsatea and Helen Corsatea Macmillion, and is survived by a brother, Cornell of Warren, and a sister, Virginia "Dolly" Selanik of Pickerington. Family and friends may call from 2 to 4 p.m. Sunday with Saracusta (prayer service) at 3 p.m. at the Peter Rossi & Son Memorial Chapel. Friends may call again at 9:30 a.m. Monday at Holy Resurrection Romanian Orthodox Church, followed by a 10 a.m. service with the Rev. James Barkett officiating. Burial will be in All Souls Cemetery with a military service. All donations in celebration of Tom's wonderful life should be made to Holy Resurrection Romanian Orthodox Church, 1836 North Road N.E., Warren, OH 44483.